If you’re even listening to seven inch singles, you should have some knowledge of what your Grandma would refer to as ‘Punk’. Singles were pretty much the only outlet for a lot of those early bands few people cared about at the time. Today just about any jerk can get a couple of bucks together and get serious putting their garage or home recorded project on vinyl. So to call this punk is doing it a bit of a disservice, it’s too solid to think of this as the only outlet for this underappreciated genre. 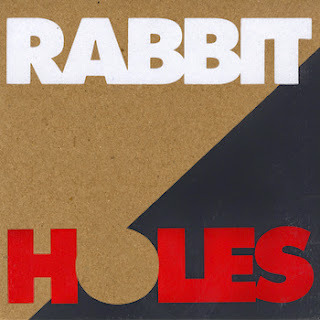 This trio, Rabbit Holes from Minneapolis, MN works with all that history behind them and still wanted this to be the format for their update on punk. "It’s Not Alright" has such a clear vision this track knows exactly where it's going. Its still got that scrapy punk feel but these guys have obviously been playing it long enough not to mess around with those settings. This is straight ahead in perfect Husker Du minor chord yelling, an epic punk that keeps going higher and higher with a real anthemic mix. It’s got plenty of changes and massive Hot Snakes style density but has me going back to classic punk, the late '70s stuff that wasn’t thinking so hard about what came before it. It's all new still relying on bare bones chords but this has explored every crevice of the arrangement without being overworked. There's a blurb about the Buzzcocks in the insert and I can hear their pop punk running through the center of this. Sliding up frets from the lower range of the neck, too thick to be The Adverts or Wipers sound the melody they hit with for that title lyric is what takes this into a great place. B-Side’s "I Ain’t Coming Back Tonight" cranks up the tempo and launches right into this more of a greaser garage sound here, with a killer verse melody. I don't know if Jon is primarily writing this but there are aspects on par with Jeff Novak, the clarity and catchiness - it's nothing obvious - they almost have so much going on at points it hits a No Age dense fuzz, but they keep pulling this back down into the gutter. That punk gutter I don't mind shuffling around in. It's fun down here, there's a lot of junk and garbage but you can really let loose around that bit of glam chords, these are heart racing tracks and I love these screened matchbook style sleeves. Doing it yourself. Did anyone tell the Big Action guy logo that he’s the freaking creepiest? Is that the guy from texas chainsaw massacre? Get this from Big Action Records.